President Edgar Lungu has arrived in Bulawayo, Zimbabwe where he is scheduled to officiate at the Zimbabwe International Trade Fair. President Lungu who is accompanied by First Lady Esther, Foreign Affairs Minister Harry Kalaba and Zimbabwe’s Foreign Affairs Minister Simbarashe Mumbengegwi is scheduled to meet President Mugabe at Rainbow Hotel before officiating at the Trade Fair. President Lungu will open the Trade Fair this afternoon after which he is scheduled to return home. 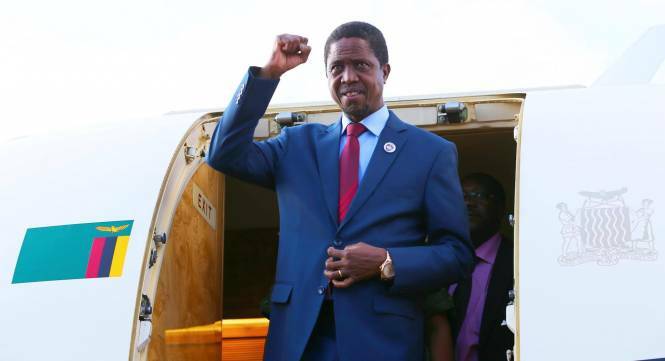 The President arrived at Joshua Nkomo International Airport Thursday and was received by Zimbabwe’s vice President, Phelekezela Mphoko, Minister of State for Bulawayo Eunice Sandi and Minister for Sports Arts and Culture, Andrew Langa. Other that welcomed President Lungu were Commerce Minister Margaret Mwanakatwe, Zambia’s High Commissioner to Zimbabwe Ndiyoyi Mutiti Zambia Development Agency Director General, Patrick Chisanga and Zambia Association of Manufacturer President Dr. Bright Chunga. On Wednesday President Lungu was in Harare attending the SADC summit whose main agenda was industrialization of the region.